A contemporary YA novel about growing up and learning that loving yourself is more important than trying to be perfect. AP Exams – check SAT test – check College Application – check Date the wrong guy and ruin everything you’ve spent your whole life working for– check Ultra-high-achiever Viviana Rabinovich-Lowe has always had a plan—and no room to be anything less than perfect. But her quest for perfection comes toa screeching halt when her boyfriend leaks racy pictures of her to the entire school. Making matters worse, her parents are getting divorced and now her perfect family is falling apart. For the first time, Viv feels like a complete and utter failure. Then she gets a job working at the community pool, where she meets a new group of friends who know nothing about her past. That includes Evan, a gorgeous guy who makes her want to do something she never thought she’d do again: trust. For the first time in her life, Viv realizes she can finally be whoever she wants. But who is that? While she tries to figure it out, she learns something they never covered in her AP courses: that it’s okay to be less than perfect, because it’s our imperfections that make us who we are. The Best Possible Answer is a book that's been on my radar for several months and now that I've had the chance to read it, I am pleased to say that it lived up to my expectations. I've been searching for a book that would give me insight to what happens when a person works herself (or himself) too hard trying to please everyone's expectations but her own while facing other earth-shattering problems, and this book gave me just that. It's down-to-earth, extremely relatable, and inspiring! First of all, I loved the chapter headers. They're about College application and essay tips, even a few sample questions about Vivianna (the main character) for the SAT's. They were funny, light, informative, and oddly the perfect way to describe Vivi's situation (including how her mind works!). I had high expectations for Vivi's character, yet I was still surprised at how strong she ends up being. She has her lows in the story, like any other person in the world, but she eventually surpasses them. However, if I had to name one specific thing about her, it's how she deals with her panic attacks. I have never experienced one, but I have reached high levels of stress to the point of getting sick due to overwork, and it's not pretty. And yet, Vivi lives through this over and over again as her world is shattered by secrets too close to home. That takes a lot of strength and I admire her for it. Another great thing is her friendship with Sammie. Having grown up together, these two girls are inseparable and always there for each other. They might face a few struggles along the way, but I love how they eventually work it out. It's seriously the kind of friendship we all wish to have in our lives! Vivi also spends a lot of time working at her building's pool along with Sammie, and it worked as the perfect setting to give this book a great summer vibe. It allows to meet so many more awesome characters--like Professor Cox--and a chance to escape the turmoil of being at Vivi's house. The romance. Even though I did like Evan and Vivi as a couple, I wish to have seen more of them together. The cover alone suggests this book has a cute romance in it, but there wasn't that much. I wanted more Evan, more feels, and why not? more kisses (or near-kisses, I'm not picky). I understand that there were more important things to handle than a summer romance, but since it is brought up, it's hard not to want more. I also feel that there's more to Professor Cox's story. He's such an interesting character and it would have been great to learn more about him, though I did love every scene he appears in! 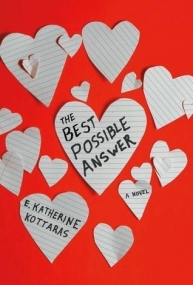 The Best Possible Answer is a noteworthy read that deals with serious themes like cheating, anxiety, and family issues but also one that is light enough to have readers smiling throughout its pages as the main character pushes through each of her problems. It's heartfelt, inspiring, and definitely one I would recommend to readers of all ages. Loved the friendship in this book! THE BEST POSSIBLE ANSWER follows Vivi, a young over-achieving student who wants to make her parents proud. After a bad incident with her ex-boyfriend, bombing her SATs, and falling asleep riding her bike. Vivi’s plans slowly begin to unravel, causing panic attacks and melt downs. From the very beginning I fell in love with Vivi as a character. All she wanted was to be “perfect” but she was far from it. What most drew me to her was how flawed she was. Here was this character who made these bad decisions, who lost control, who failed and you see how much of a toll this is taking on her. But her need to keep going, her need to find herself and what she wants is very much what had me flipping the pages. A lot of people, myself included saw will see themselves in Vivi. The choices she makes and ultimately where she ends up. Kottaras did an amazing job of bringing her to life. Giving us this flawed character and letting us watch as she grew and came in to her own as a person. THE BEST POSSIBLE ANSWER focuses mostly on Vivi. The choices she makes and how those choices good or bad will shape her. Watching Vivi go from being afraid to fail to someone who accepted who she was, really made this book stand out. I loved her for the flaws she made. They way she never quite felt good enough. It was heartbreaking and tough to read, but so worth it. Kottaras took me on an emotional rollercoaster with Vivi and I couldn’t be happier for it. Sammie and Vivi’s friendship was not something I enjoyed at first. The whole drama with a boy and what-not caused me to not like Sammie very much. What changed my mind was the way Sammie had Vivi’s back. She was there, despite being mad at each other or getting in to fights, she was there. Every time they fought it cause my anxiety to go up, but they never stopped being friends. The focus wasn’t on them becoming friends again. It was very much on Vivi and her growth. In the end I found myself in love with their friendship and very happy with the way that it was written. I am and always will be here for female friendships! In general the way Kottaras portrays the relationships in her book, had me crying but also had me so in love. The conversations and the thoughts that Vivi thought her mom had, was so heartbreaking and real. There’s this strain on their relationship that doesn’t allow them to have real, tough conversations with each other. Her mother wants to protect her and give her a better life than the one she had, but because we only see through Vivi’s eyes, we don’t see that. A little side note, Kottaras’s chapter headers were just the cutest. Every chapter had a different test question or college admissions tip. It was very clever and cute way of going in to each chapter. It was also not something I’ve ever seen before. The lack of more interactions between Evan and Vivi. I really liked what they had between each other, and I would have loved to see more. To learn more about Evan and get a bit more on what his home life was like. Plus I always really enjoyed their interactions between each other. Their back and forth, and their flirting (well Evan’s flirting) was the best. Ultimately I loved that it focused more on Vivi, I just would have loved to see more smooching! Last thing that left me wanting more was that ending. Vivi has grown as a character. She’s stood up to her father. She’s learned who she is and she is accepting that. I just wish I could have seen where she ended up. Did she get into college? What college? How are her and Evan doing? Just a couple things that an epilogue would have been perfect for! I guess leaving it up to my imagination isn’t a bad way to end the book! Overall I thought this book was an adorable, and at times heartbreaking, quick read. I sat down in one day and read this thing cover to cover. I loved the characters, the growth and the strength in this book. Kottaras writes some amazing characters that I could easily fall in love with forever. I think young girl, young women, and mother alike will fall for this book. There is so much good in this book, I can’t recommend it enough. "The Best Possible Answer" takes place during the summer between Viviana (Vivi)'s junior and senior years of high school, when her life undergoes a huge overhaul. The book begins when Vivi is on the way home after bombing her AP exams and crashes her bike. She is stressed from being unable to please her father with her academic work, the fact that he has left (for which she blames her failures), and a lingering photograph of her that she had sent her cheating ex-boyfriend Dean privately. After the accident, doctors advise that she slow down and take it easy. However, Vivi has a plan for her life and education- she wants to go to Stanford like her father- and so she has to work hard and make sure things get done. After the doctor's advice and her parents' repeal of the summer engineering camp she was planning to attend, Vivi takes an easy summer job with her best friend, Sammie, to check people in at the pool for their apartment complex. The summer doesn't go as easily as she expects when she meets a boy, Evan, who coincidentally had been her first kiss 4 years before. Sammie is interested in Evan, but he seems more interested in Vivi- this threatens to tear the BFFs apart. Vivi isn't sure she's ready to trust anyone again after Dean- and besides, she needs to buckle down and prep for college applications. The book is not really about Vivi and Evan's relationship (or lack thereof). In fact, the winning relationship here is the BFF connection between Sammie and Vivi- their friendship is incredibly close and strong. They help each other through the many events that threaten to break each girl apart. Vivi has a lot to deal with and a lot about herself and her family to come to terms with- everything is not as it seems. I admire the way her mother handles the situations that arise. Vivi has a strong fight-or-flight response to tough situations and this arises throughout, as well as shows the impacts on her family and especially her little sister Mila. I won't say much more so as not to include spoilers. Vivi really grows into her own throughout the book and learns about what she wants and what she values. These kinds of realizations don't come easy. This is a book which deals with some pretty heavy issues for Vivi and for her family. It's well written and reads pretty quickly but is by no means easy. There are some big issues addressed in the book, even with other characters (such as Evan and Professor Cox). It's a good read and a quality lesson in how to figure out what you want and how to move on from big obstacles. Please note that I received this book from the publisher through netgalley in exchange for my honest review. had a slow start but i finally finished it! hooray! slow read for me at first, not because it was bad... i just had a lot of going on. but i do feel like the setting was over explained, that it made me pause on reading the book. the book is written in four parts. i gobbled up the last two and a half parts because I personally thought they were the juicy good parts! i personally thought that the problems are something everyone has read before, something people would find relatable, and something that is not new. But the way it was put together was amazing because you still want to know how it will end. I personally felt heartbroken with what Viviana has gone through. It kind of felt i was feeling what Viviana was feeling. which i personally think is such an effective story telling, because the writer reached what she's trying to convey to the reader. i love the fact that this is more about self, family, and friendship than romance because the book description was kind of set off as that. well written, fair plot, and amazing hold on readers. i personally think teens would definitely relate to this book very much.